As a general rule, I'm not fond of anthologies. Why raid the refrigerator for a bunch of different random stuff, all mixed together and all of which you've tasted already? Isn't it more satisfying to find something you've never had before, or choose just one thing you know you like and eat until you drop? Plus, if I wanted to listen to the greatest hits of a band, I could just go back to their previously released CDs, where each of those songs has certainly appeared; the thought of shelling out money for a 'new' album that's a mere collection of bits and pieces of other albums (especially if I already own them!) doesn't appeal to me at all. Who, exactly, is the target audience for anthologies? 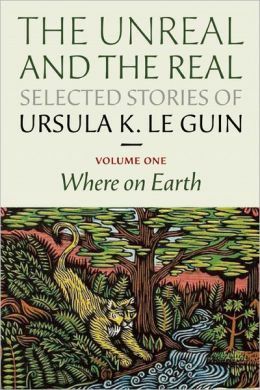 Avid LeGuin fans will have read most or all of these stories before and might feel cheated, whereas neophytes probably won't understand how these particular stories function and fit into her larger oeuvre (which is Pretentious-talk for "body of work"). Who, then, is left who might be able to appreciate the much-maligned anthology? Me! I'm what you might call a lapsed, moderately avid fan of LeGuin, or more specifically, of her novels; when I was younger, I had little interest in short stories as a medium, and none at all in short stories about the "real world": in other words, any stories not overtly devoted to escapist science fiction or fantasy themes were dead to me. 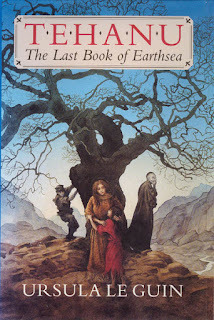 So whenever I heard about or saw another story in LeGuin's fictional but (usually) all too drearily real Orsinia or the like, my eyes glazed over and I reached reflexively for one of her more straightforward science fiction novels instead. You've probably guessed that I really liked this volume of short stories, so you may well expect me, at this point, to say something like "what a fool I was—I wish I'd been open-minded enough to appreciate those stories years ago", but in fact, I don't regret how things turned out. It's sort of like the first time I tried to read Ulysses, mostly just to prove I could; turns out that's not a very good motivation for reading something. I hated it, and stopped reading almost immediately in disgust. But a few years passed, and then suddenly it just felt right to read it...that's pretty much what happened now, with my belated discovery of LeGuin's less science-fictiony stories. Sure, like all anthologies it suffers from some unevenness in story quality; LeGuin has a tendency to write in a fascinating style, a hybrid of minimalism and just slightly pretentious pithiness; when the story can support that kind of emotional payload, it's powerful stuff, and doesn't feel pretentious at all, but in some cases, the stories weren't quite engaging enough. For example (from Brothers and Sisters, one of my least favorite stories of the collection): "Her sorrow boasted of itself. She rose to the occasion like a lark to the morning. His silence and her outcry meant the same thing: the unendurable made welcome. The younger son stood listening. They bore him down with their grief as large as life. Unconscious, heedless, broken like a piece of chalk, that body, his brother, bore him down with the weight of the flesh, and he wanted to run away, to save himself." Taken out of (or even in!) context, this strikes me as a bit overwrought. What's so remarkable about LeGuin, though, is that this same style, in some cases, has real emotional power: she had me in tears, several times, with some of her finer stories. Real tears, mind you, necessitating a Kleenex and everything—when's the last time a book actually managed to move you to tears? Moreover, even though none of the stories are overtly S/F in nature, LeGuin does include some fascinating starting premises for several, including a town that magically relocates within Oregon from time to time ("Ether, OR"), and a type of technology that creates a visualization of another's conscious thought, which in her telling is being used, behind the Iron Curtain at least, to crush opposition even on the level of thought ("The Diary of the Rose", probably my favorite story of the entire volume); both stories are excellent, especially the latter, with its heart-rending examination of the rapport building between a doomed patient and a doctor powerless to intervene. Indeed, LeGuin shines brightest when she's describing human relationships, especially those within a family; she's not as convincing when she discusses big sweeping ideas in a more abstract way. Her treatment of Soviet-era Eastern Europe, and especially the glorious, idealistic tearing down of the Iron Curtain in "Unlocking the Air", feels too simplistic, almost binary in its oppositions of soldiers and poets, guns and words, evil and good. Yet even within that very story, she delivers some passages, concerning the mother-daughter relationship in particular, as fine as anything in her work. Long ago I eagerly devoured the Earthsea trilogy and most of LeGuin's anthropological S/F stuff, and only now have I reached the point where I could appreciate this volume, a good sampling of the rest of her work, which is quieter, with few explosions and whatnot but, instead, a great deal of ordinary life, in the Virginia Woolf sense. As such, this volume probably won't appeal to everyone; a good test to see if you're 'ready for it' would be to try reading the fourth Earthsea novel, Tehanu (assuming you've read the Earthsea trilogy already). If you throw it down in disgust, I recommend waiting a few years before you pick up this volume of stories; if, however, you find yourself appreciating at least some aspects of Tehanu, then you won't be disappointed by what these stories have to offer. The Ultimate Litmus Test for LeGuin: if you don't hate Tehanu, you'll probably like Where on Earth!